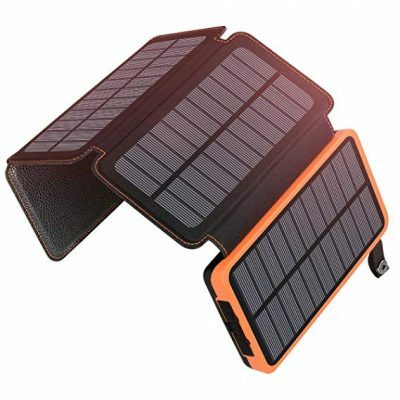 25000mAh SOLAR CHARGER: Provides large battery backup for usage during outdoor activities. The power bank can charge an iPhone 6 around 10 times, Samsung S6 around 7 times and iPad Air around 3 times on a full recharge. FAST CHARGING: Dual USB output ports can charge 2 devices simultaneously up to 5V/2.1A with Quick Charge. Charging will auto-stop when the phone is fully charged. 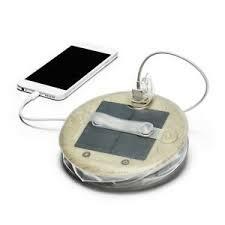 EMERGENCY LED LIGHTS: The solar power bank is equipped with a bright LED light, works perfectly in darkness, and is ideal for outdoor trips or emergency events.